Today’s guest post is brought to you by Samantha from Mommy to a Princess. Take a few minutes to check out her blog after you read this! She is the 28-year-old mother of Princess Roxy and wife to Russ. She is a paralegal at a small law office in Kentucky and is involved with her local March of Dimes chapter. In her spare time, she blogs about the antics and milestones of raising a 29-week micropreemie. February 14th. Valentine’s Day. Its only 5 days away! Are you ready? I checked Wikipedia when I agreed to do this guest post to read up a bit on the history of Valentine’s Day. I already knew it was previously known as Saint Valentine’s Day, but I didn’t know that it had been taken off the Roman Catholic calendar. I wonder how they decide to remove a special day from the calendar? I was also shocked to know that Valentine’s Day originates from way back in 500 A.D. That’s a long time! Unfortunately, I believe it remains on our calendar today as a commercial holiday that boosts the economy one $60.00/dozen rose purchase at a time. How do you celebrate Valentine’s Day? Is it with the usual flowers/chocolate/dinner out? The first two Valentine’s Day when I had a boyfriend, I received stuffed animals. The first was liberally sprayed with my high school boyfriend’s cologne. I guess it was the thing to do back then. My first Valentine’s Day with Russ I received a dozen long-stem roses at work. Along with two other dozens of roses from family members who didn’t want me to be the only one at work with no flowers. Um, where do I put three dozen roses on my desk? I even had a co-worker offer to buy a dozen so that he wouldn’t have to order any for his wife. A massage. I don’t care if its 30 minutes or an hour. Its a little bit of heaven for a hectic mommy. New socks. Goofy request I know, but I can’t help it. I am spending way too much time in the morning trying to find two socks that match or that match the outfit I am wearing. A meal that I don’t have to cook and that I can eat while its warm. Any of the commercial V-day gifts would work, too. Flowers, chocolate. They are always good. A new furnace. Because, well, we just got a new one and even if we hadn’t, they are a bit expensive for Valentine’s Day. However, according to a local radio station and their advertising, it would be the perfect way to “warm” your significant other’s heart on V-day. Bacon anything. A search on MSN led me to a site with anything bacon – bacon candles, bacon flavored coffee, chocolate bacon, bacon bandages for boo boos. Yep – its not happening. As much as I love bacon for breakfast, I do not want that smell hanging around my house. Ick! A picture frame. I tried this one our first V-day together. Its still in my closet somewhere because Russ left it at my house and never tried to take it home. Candles. I saw an advertisement for candles for V-day. It was a set of two for $73. $73 for a candle? I don’t even want to pay Yankee Candle prices and I adore their candles! These two were supposed to be two different rose-based scents (enough for a migraine to start right now!) that could be burned separately or together. The other selling points? When sitting together their abstract design forms an abstract heart. Same with the packaging. No need to wrap. For $73 I had better not need to wrap them! It’s not to soon to start thinking about Valentines Day! 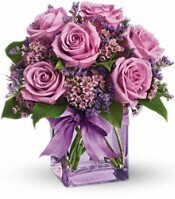 You can send flowers with Teleflora and make your special Valentine smile! Their flowers are designed in beautiful arrangements and hand-delivered to your Valentine’s door by a local florist. 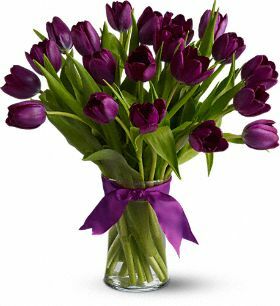 Nothing will delight them this February 14th like Valentine’s Day flowers delivered to their office or home! The romantic Valentine’s Day bouquets will show them how much you care! I know that I love getting flower and have even sent them to my husband at work! I think it caught him off guard…. he totally didn’t expect it! Surprise your sweetie this year!